I’ll try to capture as much of NaNoWriMo and other interesting things here in video form. You just have to tell me if you like these or not. Today, I’m talking about entering the RITA awards for the first time, learning to dictate a book this month, and starting a new podcast. This entry was posted in Books and Movies, Creativity, Writing and tagged Kitty Bucholtz, Love at the Fluff and Fold, NaNoWriMo, National Novel Writing Month, podcast, Romance Writers of America, Video blog on November 1, 2017 by Kitty. My Public Display of Dieting – Run, Baby, Run! Black Widow and Iron Man at Disney World for John’s birthday this month! I did it! I finally hit the button and registered for the 2018 Carlsbad Half Marathon! Woohoo!! Now I really have to focus on getting back onto the wagon. I picked out a training program I found online that I’m pretty sure I can do. (Someone reminded me that whatever I can or can’t do is all in my head. 😉 So true!) The race is 12 1/2 weeks away, so I start the training on Monday. I’m nervous. No one likes to fail, and it gets harder to try again every time you do try and fail. It’s easier to just give it up entirely. But I really love the feeling I have when I’m running strong. 😀 To get that back, I’m going to have to work hard. Maybe harder, if it’s true that getting in shape gets more difficult every year. But when I think of how great I’ll feel…it seems worth it to push forward into a potentially difficult time. I’ll let you know how it goes. I look forward to sharing lots of good news with hopefully only minor setbacks. 😀 And I look forward to hearing your encouragement along the way! Thanks in advance! This entry was posted in Personal and tagged diets, exercise, healthy eating, Kitty Bucholtz, My Public Display of Dieting, running on October 17, 2017 by Kitty. Goodreads Giveaways for Love at the Fluff and Fold – Worldwide! Due to the high cost of postage, I limited the number of copies that I can send around the world to two, but I will send them anywhere. Anywhere. I don’t know how many countries are listed on Goodreads, but it’s a lot! LOL! Click the button to enter below – and good luck! P.S. If you haven’t read it yet, the first chapter is posted here. This entry was posted in Books and Movies, Writing and tagged book giveaway, Goodreads Giveaway, Kitty Bucholtz, Love at the Fluff and Fold, romantic comedy, sweet romance, The Strays of Loon Lake on August 20, 2017 by Kitty. Love at the Fluff and Fold is ready to purchase, and you can read the first chapter right here. I’m so excited about this story, definitely my best book yet! I hope you enjoy reading this sneak peek! “Wanna take the boat out tonight?” If there was one activity Willie loved most, it was fishing. Trout, bass, walleye, smelt – he loved them all. He and Dill had been fishing together since they were just out of diapers. He had the photo evidence to prove it. Willie nodded. He and Dill were quite proud of their texting skills these days. Not many of their retired friends had gotten on board with that particular method of communication, but Willie found that his nieces all stayed in touch more frequently if he texted them rather than called or emailed. No one wrote letters anymore since his wife, Velma, died. Willie’s youngest niece, Cassie, had been driving back and forth to Northwestern Michigan College in Traverse City, about forty miles away, often carpooling with Dill’s granddaughter, Beth. “How’s Cassie doing with, uh, you know.” Dill waved his hand vaguely through the air. Danny Kessler was like a son to Willie, just like Cassie was like a daughter. The two kids had grown up together in Loon Lake, had been all but joined at the hip since kindergarten. He’d thought for sure they’d wind up together. But just about the time the two of them had started noticing that their best friend was a little more interesting, a new girl had sailed into town and ruined everything. Danny had fallen hard for Bright Shiny, the not-so-secret nickname his friend Jax had given Lily. Willie nodded. “He’s been working his way up in that big construction company near Lansing. Getting promoted, doing more than they ask, getting noticed.” He didn’t try to keep the pride out of his voice. He’d been the one to give Danny his first hammer. Willie waited and was soon rewarded. Dill grinned and dropped his hands to his hips. His friend couldn’t resist the cockamamie plans they cooked up together. “It just might work,” Dill said. Cassie walked as fast as she could to the administration building at Northwestern Michigan College. She needed to pick up her cap and gown before the office closed. Two more weeks and she’d be free of school. Finally. She enjoyed taking classes, but she’d been working on her associate’s degree in hospitality management, and then her bachelor’s degree in business administration for seven long years. Thank goodness NMC had the University Center. She could get her bachelor’s degree from Ferris State University without having to move away from home. She’d thanked God for that innumerable times over the years. While most of her classmates were locals, hardly anyone lived as far away from Traverse City as she did. And none of them planned on living in a town the size of little Loon Lake after graduation. She didn’t care what other people thought, though. She loved her hometown and planned to stay there. It had character. And characters. Life was never dull, even on days she wanted it to be. She turned in her paperwork a few minutes before five o’clock, breathed a sigh of relief, and headed for her car. During the forty-five minute drive back to Loon Lake, she thought of all the things she could do this summer since she wasn’t taking classes. She could relax. Go to the beach more. Go fishing with Uncle Willie more. Hang out with Tabitha and her kids more. Maybe she’d even get a dog. On impulse, she pulled into Sonny’s Restaurant a mile from home to see what kind of pie they had today. The fruit pies were made with canned or frozen fruit this early in the year, but they had a banana cream, Uncle Willie’s favorite, and a chocolate silk, her Achilles heel. Pulling into her parking space at the Loon Lake Fluff and Fold, she gathered her backpack, her purse, and the bag with the two pieces of pie, and headed upstairs to the apartment she’d shared with Uncle Willie since her mom died when she was fifteen. Now that she was graduating, she’d need to decide the rest of her future. Like maybe getting her own place to live. Her uncle had been adamant about not taking out student loans, which was why it had taken forever to get her degrees. Earning the money to pay cash made college a part-time pursuit. But now she would start this next phase of her life debt-free. The pie was too small a thank-you for everything Uncle Willie had done for her, but he knew how much she loved and appreciated him. She really was blessed. Which was something she needed to remind herself of now and then. Her mom was dead, she hadn’t seen her dad in years, her almost-fiancé had dumped her, her once-best-friend wouldn’t talk to her, and she was twenty-five years old still living at home. But that was the empty quarter of a very full glass. Upstairs, she dropped her bags in her room, found a place for the pie in the fridge, set out some ground beef to thaw, and wandered across the street to see if her uncle was in The Laughing Loon. Uncle Willie was quite the businessman, and he’d taught her at least as much as she’d learned in college. He owned three businesses on this corner of Loon Lake – the Loon Lake Fluff and Fold, The Laughing Loon convenience store and gas station, and the Idle-Awhile Cabins. He’d sold the Cup and Cone Ice Cream Parlor before her mom died to help pay for Cassie’s and her sisters’ college tuition. Since then, he’d worked with the Alexanders, local goat farmers, to sell small containers of goat’s milk ice cream and goat’s milk cheese at The Laughing Loon. It was a big hit with tourists and locals alike, and Uncle Willie got to continue feeding his ice cream habit. A bell tinkled overhead as she walked into the store. She waved to a few customers she knew and stepped behind the counter to bag groceries while Uncle Willie rang up the items. “You’ve tried it? I just love passion fruit.” Nancy Franklin was the history teacher at Loon Lake High, one of Cassie’s former teachers. She traveled every summer and brought back pictures and videos to show the kids what the rest of the world looked like. Cassie had loved that class. None of her college teachers had made learning as fun as wacky Mrs. Franklin. “He thinks it’s his job to try all the ice cream before he sells it,” Cassie said, grinning at her uncle. “It’s good business to make sure you’re selling quality products,” Uncle Willie insisted. “Kids these days.” He shook his head at Mrs. Franklin, who laughed with him. Cassie helped him with two more customers, then gave him a hug hello in the lull. Her uncle raised his eyebrows. Uncle Willie grunted. But his eyes twinkled in fun. Looking through the DVD rentals, Cassie picked an oldie-but-goodie that they both loved, RED, a spy comedy with Bruce Willis, Morgan Freeman, and Helen Mirren. She checked it out behind the counter, told her uncle she’d meet him at home, and left to make dinner. Before heading upstairs, she walked through the laundromat to make sure nothing needed attention. She’d been working for her uncle since she was ten, along with her once-best-friend, Danny Kessler, and she’d learned that providing good service in a clean and friendly atmosphere was key to bringing customers back time and again. She tended to check things anytime she passed to make sure their customers were getting what they deserved. Cassie laughed. This was the third time in six months that CW had a problem with a machine. She pulled out her phone and called Edge, Jax Edgerly’s older brother — no one called him Leroy. The leather-clad biker was a mechanical wizard who could fix anything with a motor. He promised to stop by the next day. Sitting on the couch later, watching the movie with her uncle and eating her yummy pie, she thought about her very full glass of life. She still had plenty of friends from high school, and she’d become better friends with some, like Edge, now that they were adults. She and Tabitha had grown even closer as Danny drifted away. Even CW wasn’t the turd he was as a high school football quarterback. Of course, that new teacher, Lena Hart, had brought out CW’s best qualities lately. Six months ago, Cassie thought she’d found a man who brought out her best qualities, a man she might fall in love with, maybe marry. But he hadn’t understood that when she said Loon Lake was her home, for now and always, she’d meant she wasn’t leaving. He’d taken a job in Grand Rapids in January and she hadn’t heard from him since. But that didn’t mean she couldn’t be happy. Like right this minute. She glanced at her uncle out of the corner of her eye. He’d been a major influence as long as she could remember. When her parents were fighting, he and Aunt Velma brought her and her sisters down to The Cup and Cone, made them laugh, and fed them ice cream. When Danny’s dad drank too much and lost his temper, Uncle Willie and Aunt Velma kissed his bruises and fed him ice cream. When both of their dads left their families within a year of each other, Uncle Willie and Aunt Velma smothered them in love and gave them stability. And ice cream. From the time they were ten, Cassie and Danny had swept the Fluff and Fold’s floors, emptied the lint traps, run across to The Laughing Loon to buy quarters for customers, and counted out the money they earned together, imagining all the things they’d do when they got older. Uncle Willie taught them both how to run a business, how to treat customers, how to level a two-by-four, and how to catch and clean and cook many a fish. Cassie smiled at the TV. She may not have a husband and kids and a big life in the big city like her two older sisters, but she was genuinely happy. Cassie felt a tiny frisson of alarm. His voice and expression were more serious than she’d seen in a long time. “Sure,” she said, trying to infuse the word with a calm that was quickly waning. Cassie felt a tremor in her stomach. Please, nothing bad. She’d lost too many people she loved. “And?” she prompted when he didn’t say anything. Cassie felt herself gasp, her hands suddenly covering her mouth. No, not this. Not yet. Cassie nodded. She had a hundred questions, and she wanted to press Willie with questions now, not wait. But he rose from the couch and moved toward his room. Cassie nodded again, not trusting her voice to work properly. He didn’t look well, couldn’t meet her eyes. Just how bad was it? Lord, please don’t take him yet. I’m not ready. He shut down that line of thinking. He wasn’t going to die this week. They wouldn’t be planning a funeral. They just wouldn’t. But if he went to church with Cassie and Uncle Willie, he didn’t want to wear torn jeans and a T-shirt. He wasn’t in high school anymore. He packed his computer bag with his laptop, a Wi-Fi device, his backup hard drive, and shoved his Kindle and a couple paperbacks into the space that was left. He wanted to call Cassie. He desperately wanted to call Cassie. But Uncle Willie had said not to because he hadn’t told her yet. His poor girl. She’d be all alone in the world. Well, she had her sisters, but she’d be all alone in Loon Lake. Who would look out for her? Once again, a pain sliced through his gut. He used to be her hero, her knight, her best friend. He used to be the one who looked out for her, brought her wildflowers, shared her favorite pizza on the hood of his car while they watched the stars move across the sky. And then he’d ruined everything. Which was why coming home was so painful. The people he loved most were in Loon Lake. The ones he hadn’t hurt whispered behind his back. They must. That’s what small town folk do. And then there were the people who were just disgusted and disappointed in him, like his mother and his ex-wife’s family. Going home was simply not an option for him. But if Uncle Willie needed him, he’d face the dragons for as long as necessary. When the crisis was over, of course, he’d flee back to Lansing where he’d tried to make a life for himself. He looked around his one-bedroom apartment, trying to think of what else he might need. He threw in a load of laundry, putting everything he wanted to take in one load, hearing Cassie’s voice, as he always did, about separating whites and darks. Then he washed all his dishes, dumped a quart of milk down the sink, and pulled out his Igloo cooler to take the other perishables with him in the morning. Working with his hands eased his mind. For a whole forty minutes, he didn’t have to think about what he would hear when Uncle Willie told him and Cassie what was wrong with his health — he wouldn’t say over the phone. When Danny was done, nothing else he could think of to do, he sat on the couch and let his mind wander. Cancer? It was probably cancer. That’s what everyone died of nowadays. Would it be slow or fast? Would he suffer? Danny squeezed his eyes shut and tried to think of something else. Maybe it was his heart. That would be better, right? Less pain? But death would come suddenly. Maybe he shouldn’t wait until tomorrow morning to drive up. If he left now, he could be there by midnight. Danny pulled out his phone and texted Jax Edgerly, his best friend. Can I sleep on your couch tomorrow night? Don’t know for how long. A week or two? A minute later, Jax replied. Sure. What’s up? I’ll explain tomorrow. Thanks, brother. He leaned his head back against the couch. God, please don’t let him die. Not yet. I’m not ready. His phone rang, startling him. He felt his heart stumble in his chest when he saw the name on the screen. Sunshine. It was Cassie. He should’ve changed the name in his phone’s address book. She hadn’t called him in two years, but the effect of seeing her nickname hadn’t dimmed. His chest squeezed just the same. Uncle Willie must’ve told her his news. He held his phone tight, immobile with regrets. He’d messed up, then messed up again. Trying to minimize future damage, he’d said something stupid to hurt her so she wouldn’t contact him again. Unfortunately, it had worked. Three strikes. But he couldn’t leave her hanging, alone, not when she must be hurting. He slid his thumb over the screen to answer. “Hey,” he said, hearing the catch in his voice and hoping she hadn’t. “Oh, Danny.” She cried into the phone without speaking for a minute. He squeezed the bridge of his nose and felt tears slipping out. Whether they were for her or for Willie, he wasn’t sure. She didn’t say anything and he imagined she was trying to stop crying. “I wish you were here now,” she whispered. Danny leaned forward over his knees, squeezing his eyes shut, trying to keep everything inside. He didn’t say anything. He wanted her, needed her, felt desperate to find comfort in her arms. But he was bad news, a disappointment, a screwup. She deserved far more. His favorite. He felt a tug on his lips that would’ve been a smile if things weren’t so grim. “Maybe,” he finally said. The silence grew, but it was the peaceful silence they used to share. There was a measure of comfort in the quiet. How would he sleep now? He’d pushed her out of his head as best he could, tried to at least lock that door in his heart. He’d never be rid of her, but now he’d have to share her space, breath the air she breathed, feel the sunshine of her presence. It just might kill him…if Uncle Willie didn’t die first. Pre-order your copy of Love at the Fluff and Fold today! 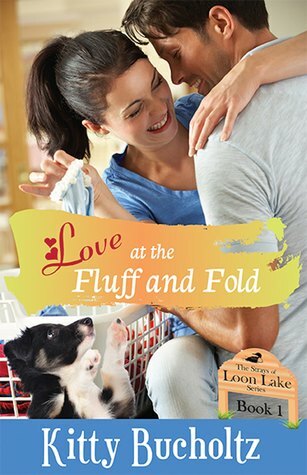 This entry was posted in Books and Movies and tagged book excerpt, Kitty Bucholtz, Love at the Fluff and Fold, sweet romance, The Strays of Loon Lake on August 16, 2017 by Kitty. I’ve put off this post until the very last day of July hoping that I will change what I’m doing and see some progress. I’m sad, disappointed, and frustrated to say that I haven’t changed any bad habits at all. In fact, a Facebook Memory post from one year ago today said that I’d lost 28 pounds! But now I’m down to 21 – having gained 7 pounds in the last few months. Why? Combination of things – an innocent bit of fun celebrating my birthday, followed by John staying home the last few months to write his next book, followed by a vacation to Michigan where we ate and drank every favorite and missed food, followed by us getting more and more down as we wait to find out when and where the next job will be. I’m actually not that concerned about my birthday celebration, our anniversary celebration, or our vacation to Michigan and its accompanying overeating and drinking. I don’t know (in fact, never knew) why in late December 2015 I decided I was done being overweight and out of shape and decided to do my 50 pounds in 50 weeks challenge. But I wish I could find that switch and flip it again! I’ve been saying I want to be my fittest by the time I’m 50 – that’s about 34 weeks away. I could still lose 30 pounds in 34 weeks and win the prize! But what do I need to do inside my head to make that happen? What’s most important to me? The comfort of the moment? Or a long-term goal that will improve my health, peace, and happiness? The same questions can sort of be applied to exercise. I’ve done almost none since the last race five months ago. Granted, I’ve been catching up on work that was put off during our hard times of the last few years. I’ve really been in the groove, putting out two titles already this year, with a third one coming out in August. Exciting! But my back hurts more than ever. (I hurt it exercising about a year ago, and I haven’t done much to help it.) This is no small matter when you consider that a friend of mine had major back surgery last year and was told, if I’m repeating it correctly, that it was from sitting at a computer all day for years and not doing any stretching or strengthening. Even the weather can’t keep me from doing that because those are indoor activities. I’m posting because I need to confront myself and my decision-making process. I want to succeed. I’m posting because hiding is not a positive action. We need positive actions to improve our health – physical, emotional, spiritual, the whole health of the whole person. Don’t stop trying! We can find a way to do this! EXCITING NOTE: After I posted this, I went back through the blog here and found that I was still down 28 pounds in February when I ran the Round the Bays race here in Wellington. So I’d kept off those 28 pounds for 7 months! The weight gain started when John stayed home and cooked every day and my exercise decreased dramatically. Okay, that is information I can work with!! Look at your calendar or think back to when things were going well. What’s changed? What can you do to get back into circumstances more conducive to better health? What circumstances can you change? If I can make some changes and some progress in August, I’ll post more often and tell you what’s working for me…just in case it gives you ideas for you! This entry was posted in Personal and tagged diets, exercise, healthy eating, Kitty Bucholtz, My Public Display of Dieting, weight loss on July 31, 2017 by Kitty. I missed checking in last month because…well, I was going to say because I was busy, which I was. But honestly, I kept waiting for good news to post and it didn’t happen. Mostly because I didn’t really try – hahaha! First we had my birthday celebration in March, then we ate some yummy things at Easter, then it was our anniversary and our anniversary trip in early May, then our two-week trip back home. So LOTS of extra eating and enjoying it and not trying to watch my calories much at all. That being said, I DID write down everything I ate in the My Fitness Pal app. (I’ve entered what I’ve eaten every day for a year and a half now!) And I often had a protein shake for breakfast to start the day well…and so I could have Grand Traverse Pie Company pie for lunch every day. LOL! Also, by the time we got to the last few meals of vacation (all the plane food from nearly 24 hours of flying), we were completely ready to go on a diet. On the first day home, our grocery shopping including about six different fresh vegetables! LOL! So…here I am, overweight but FINALLY ready to hit the Restart button! YAY! The scale said I weighed 177 pounds yesterday, or about 80 kilograms. To lose 50 pounds from my original high weight last January (2016), I wanted to hit 148 pounds, or 67 kilos. From today, that’s a weight loss goal of 29 pounds. Okay, the line is marked in the sand now. 🙂 Time to dig in and work on getting to be my fittest and healthiest by my 50th birthday! That’s 9 1/2 months away. This entry was posted in Personal and tagged diets, healthy eating, Kitty Bucholtz, My Public Display of Dieting, weight loss on June 8, 2017 by Kitty. All I can say is – my birthday was last month! And for ten days, John treated me to so many awesome things from horseback riding to meals at little cafes to big Whittaker’s dark chocolate bars. And I loved every single thing! Haha!! In fact, that’s why I didn’t post anything last month – I didn’t want to weigh myself. 😀 But the Monday after my birthday I put away all the sweets and cut back on my snacks and took advantage of a free week at the gym. I just finished my last day there today, and I’m going to be able to do a lot of that stuff here at home. So now I have 11 months before my 50th birthday – 11 months to lose another 25 pounds, gain many pounds of muscle, and train better so I can run my fastest half marathon ever before my next birthday. Woohoo!! Between more vegetables and tougher and more frequent exercise, I’m looking forward to feeling better than ever. And it won’t hurt my self-esteem at all to see myself looking better than ever before, too! Have you hit the Restart button lately on nutrition and exercise? How’s it going? This entry was posted in Personal and tagged diets, exercise, healthy eating, Kitty Bucholtz, My Public Display of Dieting, weight loss on April 3, 2017 by Kitty. Back at the End of the Month! This entry was posted in Writing and tagged Kitty Bucholtz on March 8, 2017 by Kitty. I can’t say I’ve accomplished much in the weight loss and greater-strength-and-health arena during the last two months. I’ve accomplished a lot of other things! Hahaha! But I’m still kind of hovering in the same area I’ve been in for a few months. But there are a few things coming up that I think will help. I will say that the morning after I ran the Round the Bays 10K race, the scale showed me down to 166 – the least I’ve weighed in ten or eleven years! But then it popped back up to the 169-171 area where I’ve continued to hover. Still, it gives me hope that over the next four weeks (i.e., before my birthday), I can lose 4-5 pounds and keep them off and restart the downward journey to 148 pounds/67 kilograms. That was my goal in January 2016 – lose 50 pounds in 50 weeks, going from 198 to 148. I’m still working toward it! This entry was posted in Personal and tagged diets, exercise, Foodist, healthy eating, Kitty Bucholtz, My Public Display of Dieting, Round the Bays race, weight loss on February 28, 2017 by Kitty. Check out the Valentine’s Super Sale & Giveaway! Here’s the link to the Valentine’s Super Sale & Giveaway! This entry was posted in Books and Movies and tagged books on sale, great books, Kitty Bucholtz on February 17, 2017 by Kitty.